My colour choice was inspired by the card at the CASEplorations Monthly Inspiration challenge. The die cuts were some I had over from another card I made yesterday - the roses were cut from a piece of watercolour paper I had coloured with Spiced Marmalade, the green card was self coloured. Before I added the die cuts I had sprayed the coloured card with a lemon shimmer spray, the shine of which can be seen in this shot. The gold embossed sentiment was stamped directly onto the card. The finishing touches were a small scattering of flat gold sequins. Any comments you leave are deeply appreciated. Fabulous effects on this one Maxine! It turned out rather stunning in the end Maxine. The delicate smooshing is the perfect foil for the roses and leaves. Maxine, You continue to surprise and inspire me with your creations. The roses make such a beautiful focal point. Thank you so much for entering our 221st challenge. We are always delighted to see your entries and appreciate your creativity. I like this card! Love the roses die and although sympathy cards are never easy to make and worse to have to give, this one is perfect. I like the CAS design, the clean-ness and beautiful simplicity of it. Yes.. it's a good sympathy card. What's not to love! This is wonderful and fresh and bright! Not a clue what a smooching technique is but the end result is gorgeous! I really like your shimmery spray over your smooshed design. I like you smooshed bit too, not overwhelming for a background. This is very lovely. It turned out beautiful. Love the shimmery background! What a beautiful sympathy card. Love those roses. Thanks for joining us at CASEplorations this month. I'm so glad you kept on with the disappointing smooshing, because this turned out to be a splendid background for the pretty floral display. I'm with you in not always being happy with how something is progressing, but I just hate to say "Quits". This proved to be the case here, as I think this is one of your best CAS cards yet. The delicate gold thread trim is perfect to enhance, but not overpower your lovely design.Well done, and I'm so happy you kept going, and shared the stunning results! The shimmer on the background is gorgeous! TFS & Happy wkend. The finished result is gorgeous. It certainly paid off to continued with this lovely card! Thanks for sharing with the Southern Girls. Love these yellow flowers! Keep on with the smooshing. It's so difficult to make sympathy cards (IMHO) and yours is just fabulous...love the use of the die-cuts and mists! Thanks for playing along with us this week at TTCRD, hope you'll join us for more of our weekl challenges. Very creative card. The shimmer spray is gorgeous behind the flowers. Thanks for joining the Crafting With An Attitude challenge. Such a beautiful sympathy card, Maxine!! Love your use of dies and the colors! Thanks for joining us at ODBD! Beautiful save again Maxine .. thanks for stopping over and saying hi.. had to smile that you had just taught the same technique as the one I had done.. it is popping up every where on net at the moment! Such a beautiful card Maxine! Simple and elegant! Love all of the shimmer that spray adds. Such a great die cut and I love the colors on this card. Thank you for joining us at Creative Knockouts for our Flower Power challenge. This card is a beauty- and I love to see it IRL- Thank you for your kind thoughts and prayers! You are so dear! I am glad you kept with this card, as it is so pretty! Sorry for the late visit - but better late than never, right? 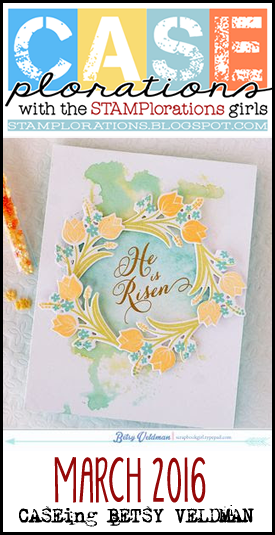 Fabulous CAS card - love your subtle background and those brightly colored die cuts! Thanks for playing with us at CASEplorations! Come back and play in our current challenge!